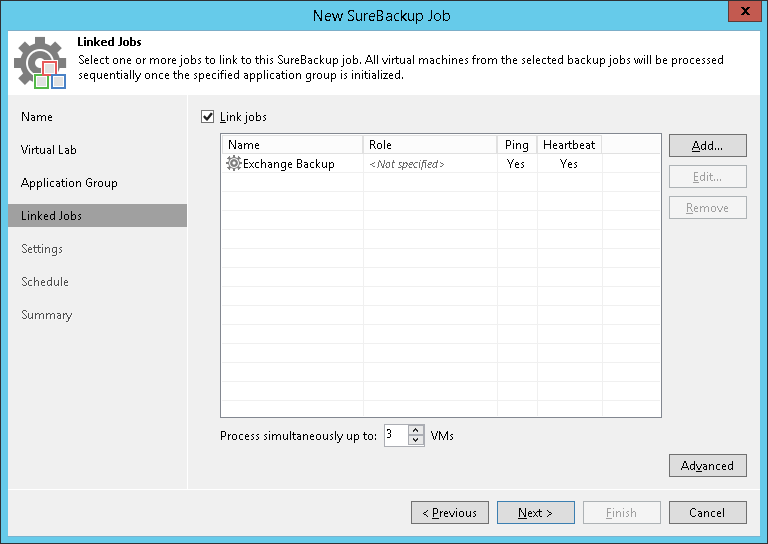 At the Linked Jobs step of the wizard, select backup jobs with VMs that you want to verify with the created SureBackup job. You can link a backup job to the SureBackup job or skip this step. If you do not link a backup job, Veeam Backup & Replication will only start VMs from the application group in the virtual lab and verify them. You have an option not to link a backup job to the SureBackup job only if you have selected an application group at the Application Group step of the wizard. Select the Link jobs check box. In the Select Jobs window, select backup jobs. In the Process simultaneously up to … VMs field, specify the maximum number of VMs that can be started at the same time. For example, if you select to start 3 VMs at the same time, Veeam Backup & Replication will create 3 streams: 1 stream per every verified VM. When the VM has been tested and powered off, the next VM will be started in the available stream. After all VMs are verified, VMs from the application group will be powered off or will be left running if the Keep the application group running after the job completes option has been enabled at the Application Group step of the wizard. To remove a backup job from the list, select it and click Remove.